A Precious Crystal Heart Award for Desk or Table with Plenty of Room for Lasering. Includes a Deluxe Velour Lined Presentation Box. 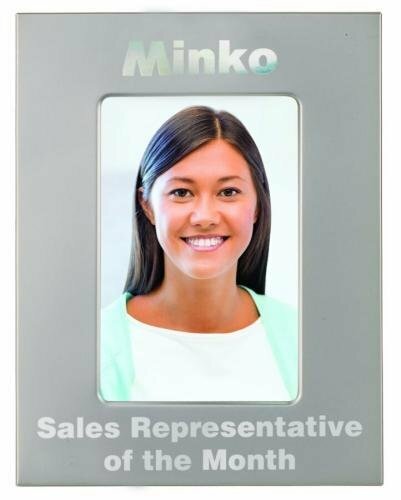 This beautiful metal picture frame is available in 3 popular sizes and features a wide border for personalization. The easel back allows for horizontal or vertical standing or hanging display. Customized for your event or occasion, this frame is a stunning recognition of achievement, or a personalized gift to display a cherished photograph. This wine bottle shaped set includes a wood case that holds a corkscrew, stopper, drip collar, and a cheese knife and fork, and has 4 rubber feet on the bottom to protect your surface. The removable lid of the box is actually a glass cutting board that can be customized with your logo for a unique promotional item, or a photo or other graphics for the perfect housewarming, shower or wedding gift. Why settle for ordinary when you can give something that's beautiful, personal, and will provide years of usefulness to the recipient. in use as it is beautiful on display. Have you ever set your wine glass down in a room full of people and then forgot exactly which one was yours? This sweet wine glass charm will put an end to that problem. The charm accepts a 1” insert that can be personalized with a name, initials, or a photo. Guests simply clip the charm around the stem of the glass to identify it as theirs and avoid embarrassing mix ups. What a charming idea for a promotional item, gift, or keepsake from a special event.